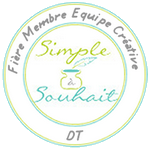 C'est le premier du mois, et chez Scrapbook ta vie on lève le voile sur nos nouveaux défis! Un défi couleurs à la saveur d'halloween, que j'ai cuisiné tout à fait autrement! J'ai pris les couleurs et les ai mises dans un contexte d'automne. J,avais cette étampe de vieille école que je rêvais de colorier depuis un bout, et je trouvais que tilda avec ses crayons était juste parfaite. Ce sont les papiers de We R memory keepers qui complètent le tout. Venez participer en grand nombre! It is the first of the month at Scrapbook ta vie, time to post our new challenges for the month. 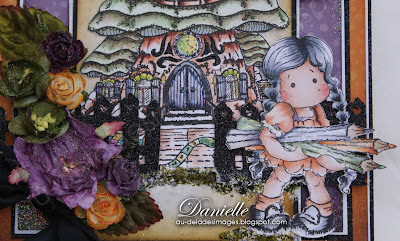 It is our DT Pascale to host this challenge, and she suggested a very Halloween color palette. I must admit I set the challenge differently for myself! I did not feel like a Halloween card, and rather made a fall card! I had this beautiful Cornish Heritage Farms stamp, called Rum Mushroom lane school, and thought that Autumn tilda with pencils, from Turning leaves collection. My papers were offered to me by a dear friend, they are from We RMemori keepers - Spookville collection. .
Voici les couleurs proposées par notre DT Pascale. this is the color palette our DT Pascale is suggesting. Well I think you know how I feel about this amazing project! It's fantastic! What an amazing scene you have created...Tilda is ready to celebrate her birthday with all her school chums! Can I just say?! Dear Danielle .. wow wow WOWWWW! This is out of this world GORGEOUS! Your colouring on everything is beyond FABULOUS and I love this scenery you've made! Gosh ... this is AMAZING!!! I sOoOOo LOVE how you create everything together .. sigh!!!! I love your card Danielle! You did a marvelous job coloring Tilda and that school house is fabulous. Lovely layers and color theme. And.... that flower collection is pretty awesome too! WOW......such an awesome card, Danielle! Love your spectacular coloring of Tilda and the school house is absolutely delightful! 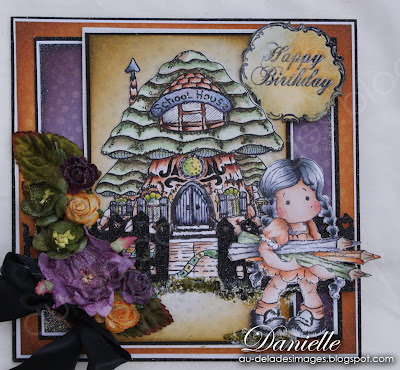 Hi Danielle, I love your card, your colours are fantastic amd stimmomg details. Tilda and the 'School House' are fabulous and wonderful colouring. Awesome card! I love the school house. Your design is fabulous too!!!! Beautifully done Danielle - leave it to you to go your own way and that is what I love the most about you! I love your school house and only wish I could have gone there. Delightful my sweet friend!!! Danielle, I am with you that I would rather make a regular card with Halloween colours than a Halloween card..LOL. A gorgeous card you've created. Cute School House. Seeing this adorable Tilda beautifully coloured reminds me that I haven't touch my pencils for quite a while now either. I am so much slower with my pencils than with markers...LOL. Love your card. I love the school house! How cute is this, your design is so beautiful and coloring too. Sometimes it turns out better if we break a few rules, I love yours. She's darling and I LOVE the School House. Awesome card, love that darling school house and your beautiful coloring on all of it and Tilda. Une belle preuve que les couleurs de l'Halloween peuvent servir à autre chose....une mise en scène exemplaire! Toutes mes félicitations Danielle. Goodness Danni, I adore that school house and those colors you chose for it.. Wish I had gone to school in a colorful school like that!! Your Tilda is so adorable and your flowers add all the charm needed to make the card a perfect halloween colors. Your card is beautiful. Luv the background too. C'est de toute beauté, wow!!!!! This is darling, Danielle. I love how you colored your Tilda and the school house. Darling papers and love that flower arrangement. Bonjour danielle!!! !What a spectacular scene you created!!!! Love the design and colors !!!! Wow excellent work again!!!! Cette carte est absolument superbe! J'adore ta composition et surtout les couleurs utilisées. i love the school house and the colouring is awesome. 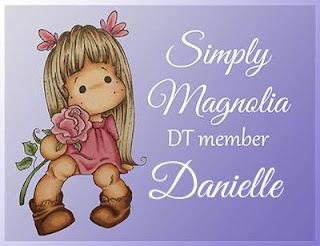 Hi Danielle, your card is gorgeous! I just love your beautiful coloring! And, you always find the most wonderful flowers to add to your cards!Have a wonderful day! 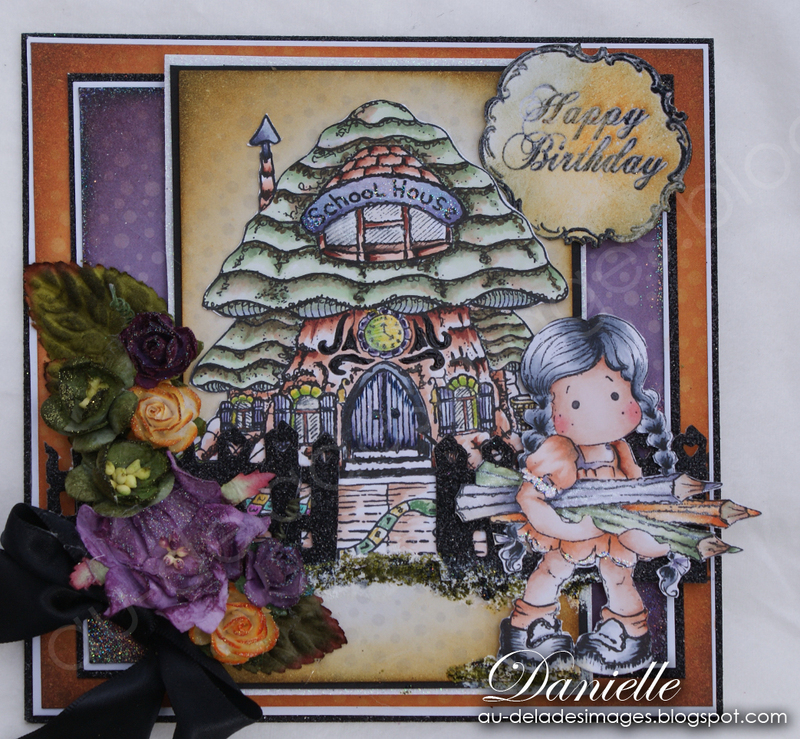 Hi Danielle and WOW to your beautiful card! I love your colouring, the fall theme you chose and the intricacy of the background stamp which must have taken a long time to colour too, such a stunning result. Hope you're well sweetie and a enjoying the weekend.